Eric Miller Animation 2017 Year in Review! Wow, what an exciting year it has been, and hard to believe the year is coming to an end. Eric Miller Animation Studios is in its 3rd year it has been an amazing year! We would like to take this opportunity to look back on all we accomplished this year, so sit back in your chair with your hot cocoa and holiday cheer to take a trip down memory lane with us. Bink has come a long way from his initial inception. Our original plan was to create multiple 30 second shorts with a fun lovable creature to show potential clients. After all the exciting work we did for Toys'R'Us we had a good amount of visual effects work to add to our portfolio. The thing we were missing was some high quality 3D animation. In an effort to get more 3D animation work we started to work on Bink. We soon realized he had a much bigger purpose, and his story began to take shape. After the first 30 second teaser we realized we wanted to create a longer more complete short. Eric, and Jared White have spent this year really digging into who Bink is, why he has been captured, and what are these tests for. We have been working on creating a fun, heartfelt story for our lovable little creature. This has taken us a lot longer then we expected for a couple reasons. One is we want to make sure his story is great, and the other is we are not able to work on it full time. As you will read below we have had a very busy year, and finding the time to work on Bink is often challenging. We are committed to making 2018 Bink's big year, and plan to release the next short. With our client work we often have to sign non-discloser agreements, so we can't always share the work we have done for them. Sometimes we can't even share who the client was, but here is what we can share with you. This year we got to work on our first feature film when we did the visual effects to bring the creatures to life for Donkey Universe Films' horror movie "Island Zero". They are currently making the rounds in the film festivals, so if you get a chance to see it keep an eye out for our work. We are holding on sharing the work on our website until the film has been sold. We worked on a live-action pilot for a production company who is developing a TV series for Amazon that has talking animals. We were brought on to make the farm animals talk. This required taking the live action footage and animating a CG face over the animals. Its actually a lot harder then it sounds. We hope the project is picked up, and hope we get to continue working on it next year. We got the opportunity to work with LoomAI on a project they are working on. While we can't talk about the project we can say how great it was getting to work with some of our old friends. We worked with a few of the LoomAI team at DreamWorks Animation before we all left to go our own ways. Our biggest project of the year(in terms of the amount of work) was working with Operation Hope doing 2D animated explainer videos to educate people on how to start a business. So far we have created around 20 animated videos for them each ranging from 2-6 minutes in length. We hope to continue helping them with more animated videos in 2018. Just when we thought the year was over we were awarded two more projects which we are currently finishing up. One is an animated logo for a production company, and the other is a visual effects project where we are creating a magical growing tree for a couple shots in a music video. Once we are able to share these we will let you know. One of the most exciting parts of the year has been working with a team of creative geniuses on developing our own animated shows. We have a few ideas we are developing, and then pitch them to the networks and broadcasters. Eric has been meeting with executives at Netflix, DreamWorks TV, Paramount, Jim Henson, and many other places to make the connections we will need. When we have a few ideas ready we plan to pitch them sometime early in this coming year. 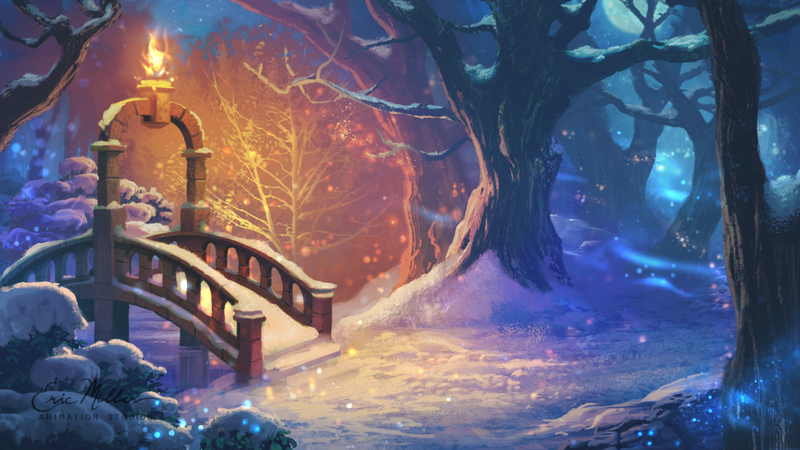 Another big announcement this year was the creation of Moonward Studios. We realized some of the work we have been doing, like the visual effect for a horror film, did not match the branding we want for Eric Miller Animation Studios(EMAS). With EMAS the plan is to be an animation creation studio where we are creating our own original content. Our focus is establishing ourselves as a creative studio, and building fans. Our main source of income, right now, is the service business where we function as a work-for-hire providing animation services to our clients. Our messaging on our website and social media needs to be talking more to those potential clients to win their trust and win new projects. It made sense to create a new division of the company with a different name, website, and social media channels which will speak more to our potential clients. Moonward Studios will handle our visual effects and VR/AR service work, and eventually take on all the animation service work. This will allow EMAS to focus on original animation ideas we develop, and produce. We have been working on a new website as well as building its own social media accounts to target our potential clients. We still have a lot of work to do, but you can check out our progress at www.moonwardstudios.com and let us know what you think. This year has been a year of growth, and we have been fortunate to work with some amazing people. Earlier this year we announced Ken Bielenberg would be serving as a member of our Board of Advisors. Eric and Ken worked together at DreamWorks Animation. Ken was actually one of the people Eric needed to interview with when he was first trying to get the job at DWA. It has been great having Ken's expertise, and his advice has been invaluable. We look forward to continue working with him in 2018 as we continue to grow the company. Mary Lou started working with us in July as the Social Media and Marketing Coordinator. She handles all the postings on our different social media channels, and has been writing most of the weekly blog posts. Ruby came on as an illustrator creating concept art for Firefly Woods, images for marketing, and the cute Bink illustrations. We recently brought on another blog writer, David Gouldthorpe, to add even more great animation content to our weekly posts. We also worked with a lot of project based freelancers who came on to help us with the different projects we have done this year. This includes people like Joe Castillon, Rich Draper, Hayden Patterson, and many others. Our goal this year was to grow our team, and find more amazing people to work with. We have also been able to cultivate a great list of very talented artists, animators, voice actors, writers, directors, storyboard artists and talent with many other specialties who we look forward to working with on our future projects. If you are interested in getting on our list please create a profile on our Crew Portal. This year we have attended a good number of animation related events. At the beginning of the year Eric attended some of the award shows. As a voting member of the Producers Guild and ASIFA he went to both the Producers Guild Awards, and the Annie Awards. This is a great opportunity to meet some of the best in the animation and entertainment industry, and also a lot of fun to get all dressed up. He also went to learn more about the tech side of animation, gaming, VR, AR and computer graphics at SIGGRAPH. Eric tries to make it to this event any year it is held in Los Angeles. One of the most exciting events for us this year was CTNX because we had a table in the exhibition hall for the first time. This gave us a chance to get Eric Miller Animation Studios out in the animation community to meet talented artists we hope to work with in the future. The Creators Society celebrated our 2 year anniversary this year. If you don't know, The Creators Society is a networking group Eric started in 2015 to bring producers, artists, and others working in different areas of the animation industry together for networking. The Creators Society has mixers every month in the Los Angeles area, and is a great way to meet other creative people. If you are interested in coming to one of our events be sure to sign up on the website www.thecreatorssociety.org. Eric has also been attending other networking events each month like the Producers Guild Thirsty Thursday, Woman In Animation Mixer, The Crux Social, and Ready Set Go. We feel it is so important to be active in our community, and networking helps you make great connections. We know how difficult this industry is, and getting started in the industry is even harder. Our animation industry is great at helping each other out, and this is one reason we love it so much. We feel it is important for us to give back, and help those new to the industry when we can. Throughout the year Eric has phone calls and meetings with students looking for advice, guidance, or sometimes just encouragement. 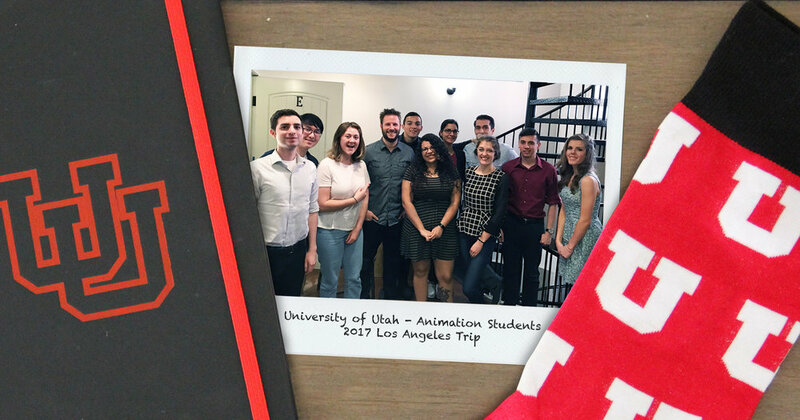 Earlier this year he met with the animation students from The University of Utah who were visiting Los Angeles. He also participated in the career day for his high school alma mater through a remote video chat, and attended events like the CalArts Portfolio Day and the CalArts Producers Show. For the fun of it here are some interested numbers for this year. This blog post is our 52nd post for this year, so it seems we managed to write a blog post every week. Our website has had 12.4k visitors this year which is a 8.2% increase over last year, and 36.5k page views which is a 12% increase over last year. We have had visitors to our website from 128 different countries with the top 5 countries being The United States(70%), Canada(3%), India(3%), United Kingdom(3%), and the Republic of Korea(2%). The highlights on our social media is we grew our Twitter followers by 3,283, and our Instagram by 1,869 followers. We hope to continue to grow, and learn in the coming year. Thank you for making it to the end of our 2017 year in review, and for letting us share our excitement with you throughout the year. Thank you for support and encouragement, and we can't wait to continue to share with all of you. 2018 is looking to be an exciting year for our industry. Click here to get a little taste of animations coming our way, and of course stay tuned with us on Eric Miller Animation Studio's social platforms for a daily dose of news in animation! We're excited to introduce Hayden Patterson! He recently finished working with us as a freelance 2D Animator on one of our client projects. We had such a great time working with him we wanted to learn more about his journey as an animator. Hayden grew up in the small town of West Bend in Wisconsin. Spending time outside with his siblings and reading Sunday comics were the results of his imagination and his inspiration to be a cartoonist at a very young age. Garfield, Calvin and Hobbes, and Sheldon are just a few of the comics he was inspired by, along with Looney Toons, especially "Tom and Jerry" being his visual influence. With the support of his parents and the guidance of his teacher in high school, he was able to go to school for Animation at Maryland College Institute of the Arts! Working at several small studios, while he was in college and over the past couple years, gave Hayden the confidence and skills he needed to move forward with his career. Some of these studios include; Moving Colour, Eskimo, and Locus New Media. Now that he is in California it has opened even more opportunities. After working as a freelance animator at Eric Miller Animation Studios, he went on to working full time at the NFL Network doing animation and other facets of video work. "I met Eric at The Creators Society Mixer, which helped me acclimate to LA and the professional network here. After the first one, I had to check out Eric’s studio online, and really enjoyed the content he has produced, particularly “Bink”, which is absolutely stunning, and adorable." He loves spending his time animating, but tries to spend time outdoors as often as possible. Being in California gave him the opportunity to spend time outdoors a little differently than he did in his childhood days in Wisconsin. He surfs any moment he gets the chance as well as playing basketball and disc golf. To check out some more of Hayden's work be sure to visit his portfolio. You need that first burst of inspiration to create memorable animation, and it is often those good conversations that spark brilliant projects. We would love to hear all about your idea and start a good conversation about all the ways we can combine your grand vision with our passion for animation.